Just a day after the much expected new year 2016 and here I am today sharing my first post for the year! 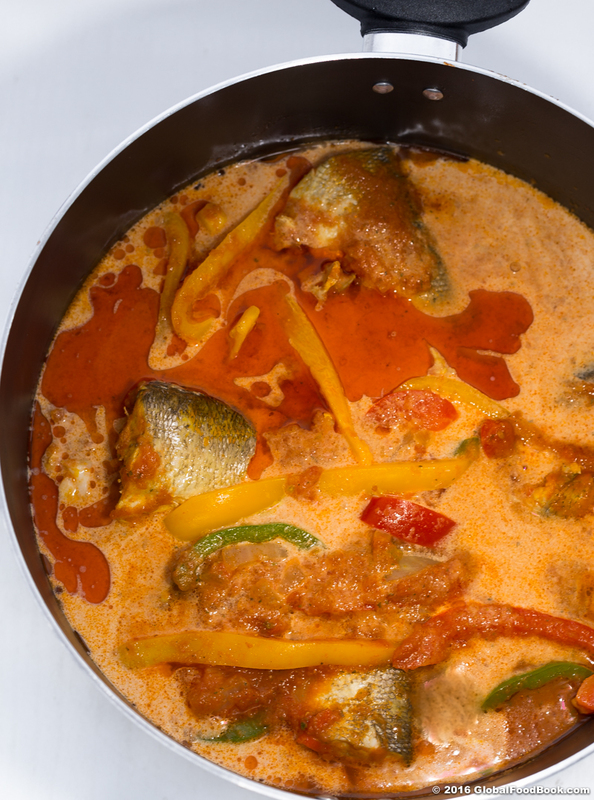 So as a warm welcome to year 2016, I present to you one of my all favourite stew dishes; Moqueca baiana (Brazilian fish stew) or mo-KEH-kah fish stew. 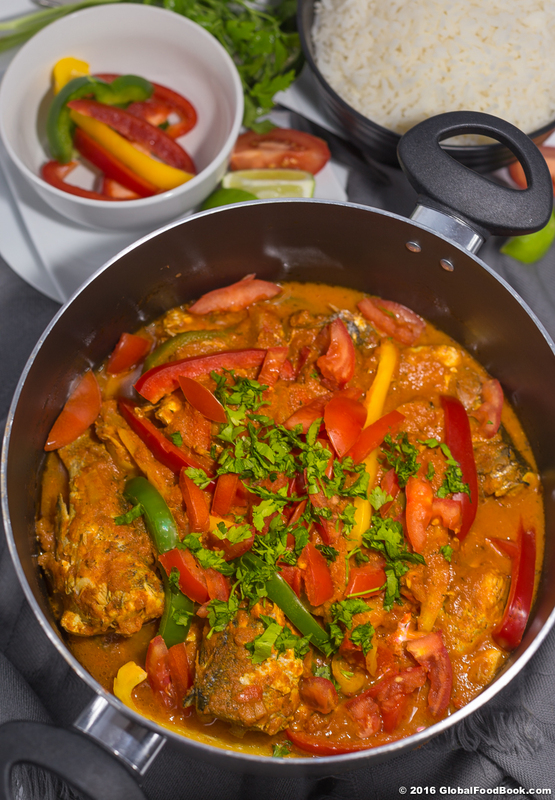 My husband called my attention to this special fish stew the last time we visited a Brazilian restaurant and I enjoyed every bit of this stew. I won't forget in a hurry the taste and aroma oozing out from this stew the very day I tasted it and on discussing with the chef, I gathered that the recipe is nothing different from the usual ways I've preparing most stew dishes in the past. The only unique ingredient in this stew is the addition of coconut milk because I can't remember ever adding coconut milk in any stews I've made in the past but this is one good thing I love about experimenting other people's dishes; the ability to combine some easily available ingredients even in a least expected way in other to come up with a tasty and super delicious meal. I can attest that this Brazilian fish stew came out resounding and super delectable even in a way that I least anticipated and to all my Brazilian fans, I hope this stew really meets up to your standard but if otherwise, please feel free to share some tips with us all in the comment section ~ ~ ~ After-all, that's the essence of globalfoodbook.com; to grow and share knowledge on everything food!!! Okay, before we forge ahead, feel free to watch this interesting video on how to make moqueca baiana with much ease!!! Besides, this new year means that I will be busy searching for some really tasty global dishes to prepare and share with my amazing fans out there. 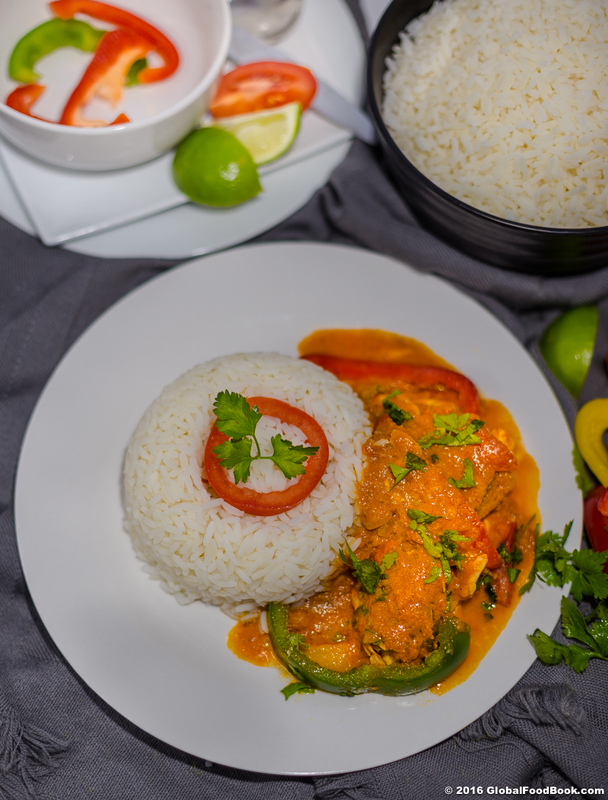 This Brazilian style stew is mainly prepared with fresh fish or sea animals caught off the rivers, oceans or seas and funny enough, I got some really fresh fish for the stew. Besides, it was so much fun visiting the fish market and selecting some beautiful sea bass fish, salmon, croaker and mackerel for some really delicious dishes to be shared with you soonish. The stew makes a healthy, delicious, flavourful and yummilicious main course paired with some cooked white rice. The stew equally presents a colorful appearance that even makes it more captivating, tempting and drooling to taste hence there is no way I won't definitely be making this stew anytime soonish. It will even be a fantastic stew to prepare more often especially during summer when tomatoes begin to ripen and fill all over the markets. So I am even gearing up to making more of this type of delicious stew come this year's summer. It is definitely going to be an awesome number of months to enjoy. 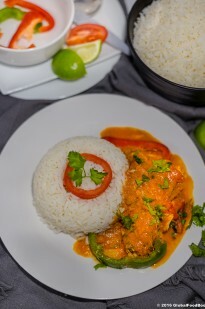 In case the name of this stew sounds a little bit strange to you, then let me just quickly mention that moqueca baiana is a popular traditional Brazilian Fish stew that is packed with some flavourful and aromatic Brazilian ingredients. Both the coconut milk and palm oil gives the stew that unique salivating taste that will captivate you to come back for more of the stew and these two key ingredients really make this stew strictly Brazilian. Luckily, I have the palm oil in my kitchen so I was just good to go for the stew and every other ingredients were just at my beck and call which made everything worked out so well for me. In case you might want to know, you can easily purchase palm oil from Brazilian shops or African shops, but peradventure you are living where you don't have access to palm oil, don't worry as this stew is not a rigid type ~ so you can freely substitute the palm oil with cooking oil, olive oil or vegetable oil. A little bit of interesting things about this stew; it is very simple to make, healthy, hearty, flavourful, uses easily available ingredients and the method of preparation is pretty easy. So tell me if there is anything not to admire and enjoy about this exotic stew? Finally, you are free to adjust the seasonings according to your taste. So in a situation the stew isn't flavourful enough to you or you want it more spicy, then add more pepper, or if you want more salt, stock cubes or herbs then just add as much as you like but be careful not to add excessively to the extent that the taste becomes awful. Just tweak the ingredients as you like since it's quite easy to pair up things depending on your preferences and what you have easily available. Besides, you are free to use your favorite spices and herbs or the type of fish or seafood you prefer as well as any type of tomatoes; either tinned, chopped, fresh, whole or blended. But you definitely need coconut milk to make the stew a complete one!!! Other than that, all that a delicious stew like this requires are some easily available ingredients and you're all set. The stew turned out really thick but if you want it to be lighter, then add more water or coconut milk; it works either way. Pair the stew with cooked rice, pasta or spaghetti and you will remain grateful for having a taste of this delectable stew. 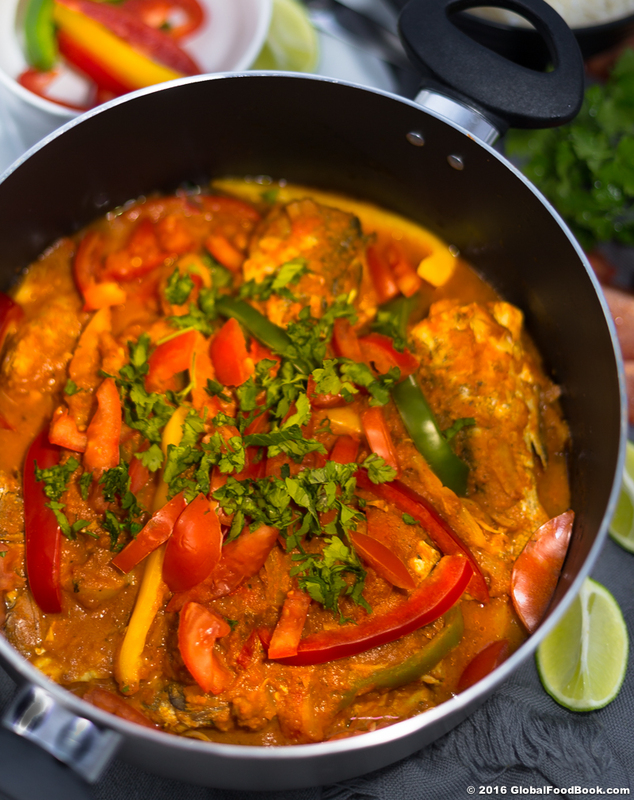 Give this exotic moqueca baiana (Brazilian fish stew) a try and no doubt you will enjoy every bit of it. Please don't forget to share your opinions with us at the comment section, every opinion counts! Clean, cut and wash the sea bass fish in a clean water then add in a clean bowl. Blend half of the chopped onions and ginger with 100ml water then pour the mixture in the fish. Add the paprika, curry, pepper, stock cubes, dried coriander leaves, salt, lime juice and bell peppers into the fish then mix properly. Cover the fish and allow to marinate for 30 minutes. While the fish is marinating, break the coconut and blend the white flesh (solid endosperm) with the remaining 200ml water. Sieve the blended coconut and set the coconut milk aside. Blend the chopped tomatoes then set aside. Slightly heat up the vegetable oil, stir in the remaining onions and saute for 2 minutes. Add the blended tomatoes and fry until slightly dry then add the marinated fish along with the marinade. 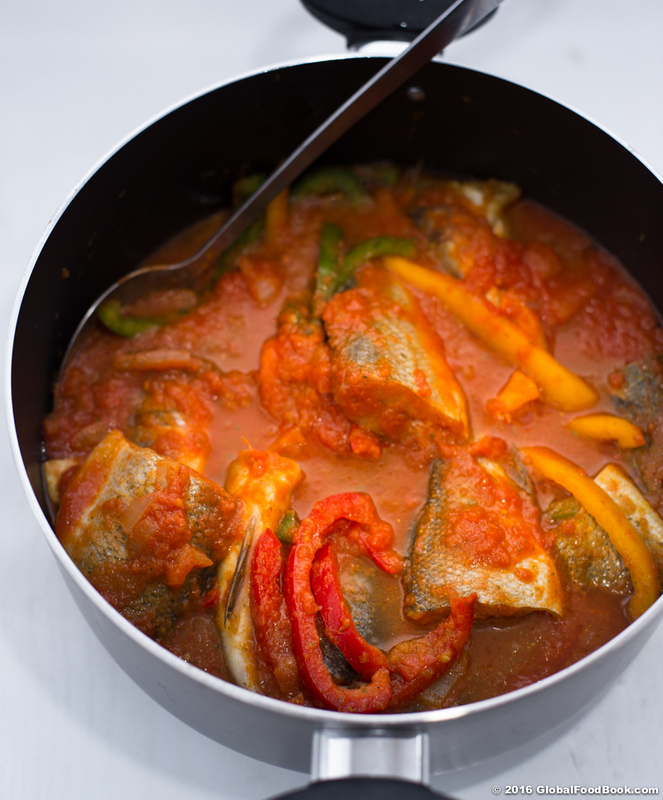 Cover the pot and allow the stew to cook until the fish is slightly done. Pour the coconut milk and palm oil and allow to simmer for another ten minutes or until the stew is thickened. Garnish the stew with the sliced tomatoes and parsley leaves and serve with cooked white rice, spaghetti or pasta.